On the second-to-last day of school, the cafeteria at Bear’s Wilbur Elementary School was abuzz with entrepreneurial spirit. Fourth-grader Valeria Lemus was doing a brisk trade in brightly-colored, handcrafted butterflies. “You can put them in your hair, or you can put them on a bag or use them as a bookmark,” she said of her versatile craft. The sale, supervised by teacher Erin Boettcher, was the culmination of Mini-Society, an economic education program offered by the University of Delaware’s Center for Economic Education and Entrepreneurship, an experiential learning center in the Alfred Lerner College of Business and Economics. Wilbur’s fourth-graders spent several weeks exploring basic economic concepts like supply and demand, pricing and the economic roles of consumers and producers. 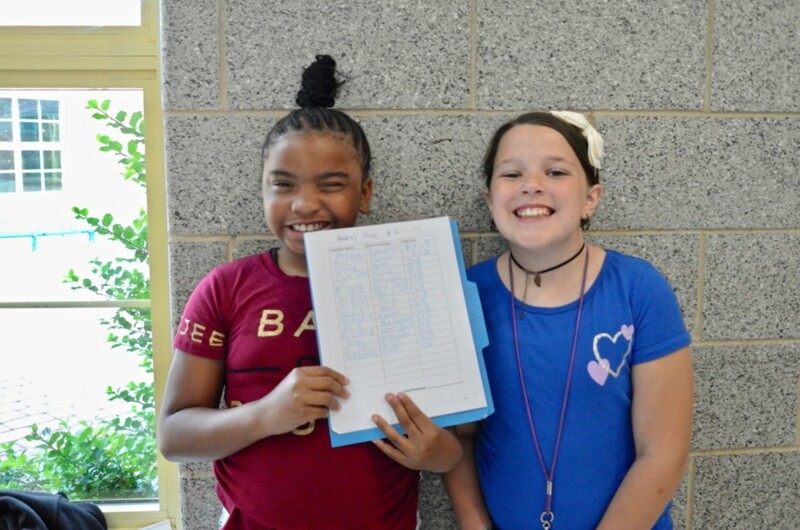 Students also learned financial responsibility by earning money to pay business expenses and using bank accounts for deposits and withdrawals. Finally, after developing products, devising marketing plans and purchasing business licenses, students ran their own businesses on two Market Days, creating a marketplace for classmates to browse and purchase their goods. Children and adults alike lined up for carnival-style games and handmade accessories. One savvy young businesswoman gave away popsicle-stick jewelry racks with every purchase of handmade earrings. Business partners Mark Caserta and Justin Wagner worked together on pet rocks decorated with animal and sports designs, with favorable results. After each Market Day concluded, students returned to the classroom to tally their profits and losses, and evaluate the differences between the two days. Mini-Society has been offered annually by the CEEE since 1976. According to the center’s statistics, the program has reached over 250,000 teachers and students over its 42-year history. “It’s the one training program we offer every summer for teachers,” said Bonnie Meszaros, assistant professor of economics and associate director of the CEEE, who co-leads the training program with Boettcher. Limited space is available for this year’s summer teacher training for Mini-Society, scheduled for July 10-12 at Wilbur Elementary.